We have seen an exponential amount of progress and change occurring in many fields in recent history; this goes for art as well, as there have been a number of new directions, styles, and methods created in the 20th century, with some of the artists going down in history. One of them that can be attributed as the herald of change is the Italian artist Lucio Fontana whose work foreshadowed Environment art and performance art that are omnipresent in contemporary surroundings. 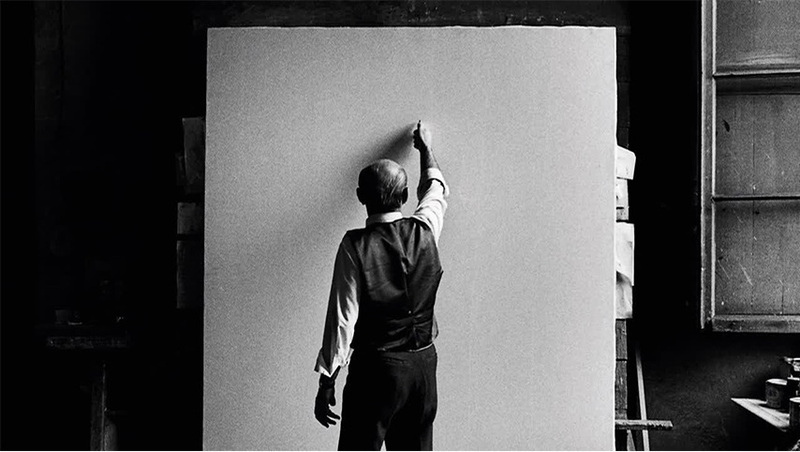 Known as a founder of Spatialism and for his ties to Arte Povera, Fontana remains one of the monumental figures in the time of great artists. 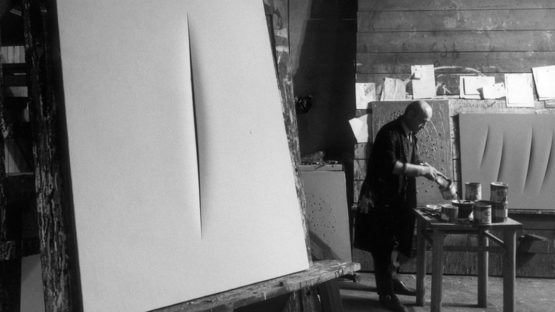 The life of Lucio Fontana started out in Argentina where his father Luigi, who was a sculptor, and mother Lucia Bottino, a theater actress, had lived. Although they were both of Italian origin, Lucio was born in the province of Santa Fe, and the mixture of both Argentinean and Italian surroundings will play a role later in his life. As soon as he reached the age necessary for schooling, he was sent to Italy for education where he remained until his college days. Attending the master-builders school at the Carlo Cattaneo Institute in Milan, Fontana actively practiced art in his father’s studio while living with his uncle. He would later complete his studies and receive the diploma of a building surveyor, but not before enrolling in the First World War. Although he was a promising young artist and a scholar, Fontana decided to volunteer as a soldier for the First World War in 1916, interrupting his studies. Intelligent and talented as he was, he reached the rank of a second lieutenant in the infantry regiment during his days as a soldier even though his background never included military training. His injury during the war forced him to return to Milan, and luckily, he was able to continue and finish his studies and of course, his artistic practice. For his contribution in the war and service to the country, he received a silver campaign medal in 1918. The years following the return of Fontana from the battlefield were marked by exploring his inner artist. This exploration took place both in Italy and Argentina, and it is possible that exactly because of his varying heritage and time spent on both continents his practice took such an innovative and explorative shape. Returning to Argentina in 1921, Fontana had worked in his father’s studio producing graveyard sculptures, all the while experimenting and researching new ways and forms of the style. After several successful years of such practice, he enrolled in the sculpture course at the Brera Academy of Fine Arts and by presenting his El Auriga (The Charioteer), he received his diploma. His investigative nature kept him going even after the college days. During the 1930s, his sculptures took on human-like figures, deprived of their accustomed form and reduced to geometrized shapes, much like in his 1930 Uomo Nero (Black Man). Investigations of form led Fontana to produce abstract sculptures in ceramics and even in colored mosaics at the beginning of the 1940s. This culminated in his first piece of work of environmental art, the Frieze Volo Di Vittorie, standing for Flight of Victories. 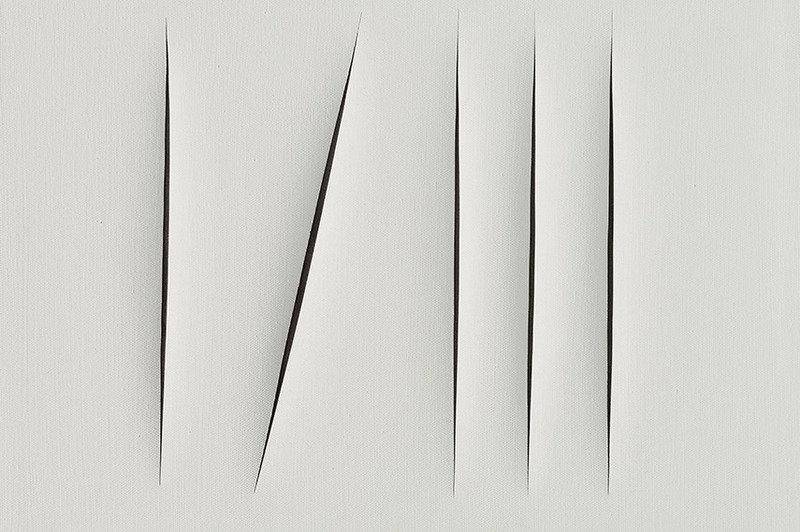 It was in the year of 1946 that the term Spatial Concept first appeared as a part of titles of a group of drawings done by Fontana. Following his return to Italy after teaching as a professor at the Esquela de Artes Plasticas in Argentina, he supported, along with other philosophers and writers, the first manifesto of Spatialism, as he had formulated various theories about the subject beforehand. What it basically consists of is expanding the artistic practice to more than just the narrative by focusing on the space around the canvas as well, using it in addition to other technologies like neon lighting and television to give the work another dimension. 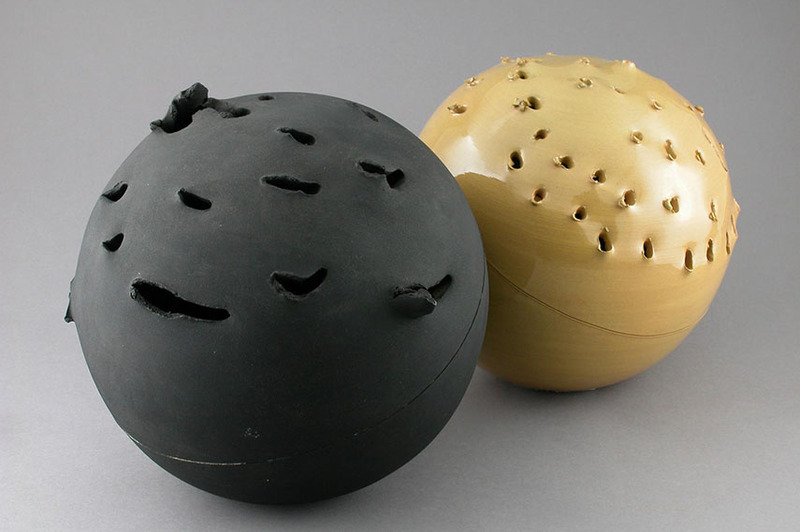 Some of Fontana’s first representatives of these theories were his slashing series that was comprised of two different types of portrayals of dimensionality: via holes (the Buchi category) and slashes (the Tagli). These punctures on the surface of the painting would reveal the area behind it often lined with black gauze, giving the piece a certain depth as the blackness of the material seeps out of the holes. Emphasizing the space behind the canvas, he switched to monochrome-like surfaces around 1958 that would completely divert the attention of the viewer towards the slashes. The way he would create his work after the Second World War through the rest of his career was largely influenced by the spatial concept. Working both with sculpture and paintings, the emphasis was often on the dimensionality of it portrayed through various gashes. As final years of his prolific career, the 1960s were marked by thick layers of oil paint punctured with holes, culminating in the strict use of single colors for his canvases in the Ellipses series, as well as sculptural work inspired by New York that consisted of metal plates punctured by the artist. 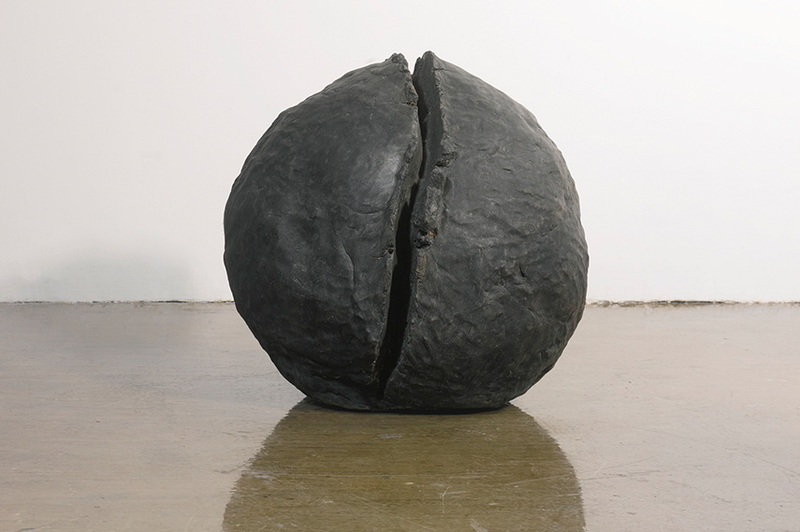 Fontana also produced a number of famous oval paintings between 1963 and 1964 in a cycle titled The End of God, one of which (Concetto spaziale, la fine di dio) fetched over $29 million in 2015 at an auction. 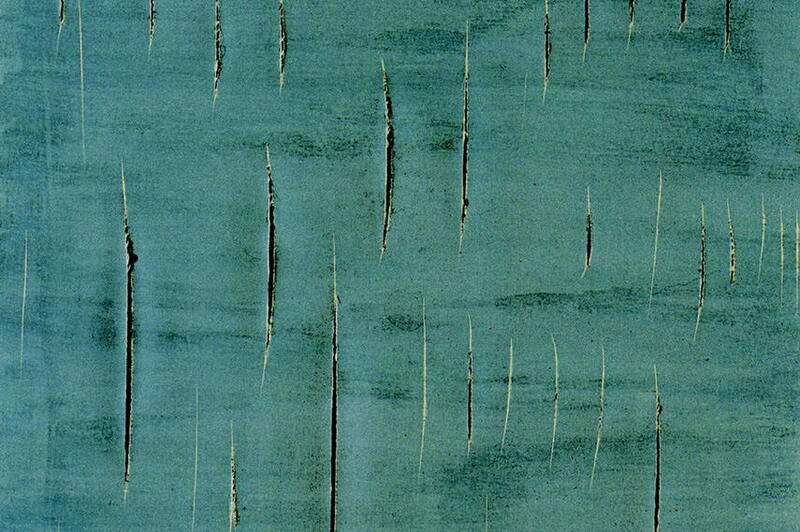 In these late years, he would also use machines to perforate the wooden panels of his paintings, keeping in line with new technical developments. 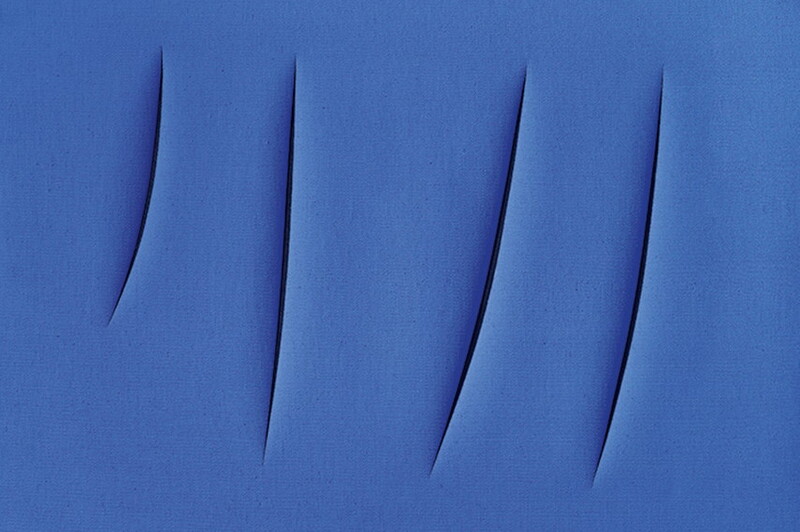 Lucio Fontana’s oeuvre is more than just visually alluring and thought-provoking, it brought about a movement that changed the perspective on art pieces. Creative in his explorative practice, he was able to invent something new on a philosophical level that transcends to art in a time of such legendary artists, making him one of the greats of the era. With so many renowned collections holding his work and many awards and exhibitions to his name, it remains written down in the history of art. The artist is represented by We Art Partners.